Universities are being warned they could be penalised in teaching quality rankings for handing out too many top degree grades. But if the proportion of students getting first-class degrees has doubled since the late 1990s, does it make any difference to those who get them? 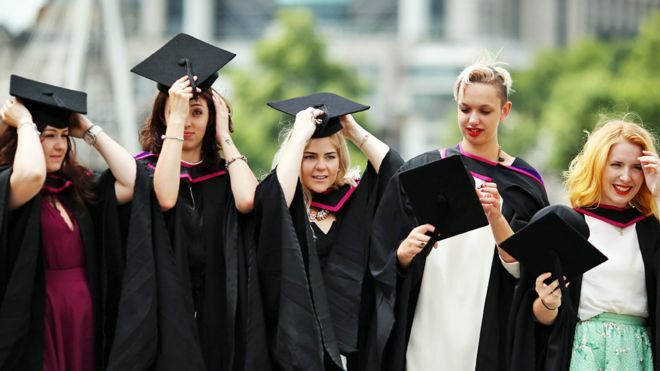 The University of Surrey has given first-class degrees to more than 40% of its students in recent years – and now about three-quarters of them either get a first or an upper second (2:1) across UK universities. Does this mean that employers are less impressed? The proportion of students getting a 2:1 or above might have been rising rapidly – but it’s still used as a cut-off by most big graduate recruiters. Stephen Isherwood, head of the Institute of Student Employers (ISE), which represents the major corporate and public sector employers, says about two-thirds of graduate recruiters expect a 2:1 as a minimum requirement. He says this is used as a “basic sifting mechanism” when there are an average of 44 applications for each graduate job. But degree grade inflation has not really inflated employers’ expectations to want a first. Mr Isherwood says many are not that bothered whether students get a first or a 2:1, not least because no-one really understands how such distinctions are made or whether they are comparable between universities. That still makes it tough for students getting a 2:2, which not that long ago would have been the most common grade, but which is now rarer than a first. If more people are getting top grades, does it mean the emphasis shifts to the subject and the prestige of the university? According to the ISE, more than 80% of the big graduate recruiters don’t really mind what subjects applicants have taken. But there are some subjects which are going to boost the chance of higher earnings. Economics and maths graduates are likely to have higher pay – along with medicine students, who will have taken a very subject-specific pathway. Students from the London School of Economics, Imperial College London and University of Oxford are on average the highest earners. There is also a big push from graduate employers to have a more diverse intake, says Mr Isherwood. This has meant less of an emphasis on degree grade or particular types of university. Employers are now using “contextualised” approaches of the kind developed for university entry, he says. That means they are using data to look at applicants’ backgrounds – so that someone with good grades from a tough school might be seen as higher achieving than someone with similar grades from a wealthy background. There are also more tech-based approaches to recruitment, he says, with online tests to check ability and suitability, and algorithms for more targeted advertising. Mr Isherwood says this is still in its infancy. But, as with university entry, this is also likely to be controversial. There has been a trend among some of the biggest accountancy and law firms to take an even more experimental approach to recruitment. They have moved towards a recruitment process without knowing where an applicant went to school or university or anything about their qualificationsor sometimes even their names. That means that any initial entry processes are without stereotypes or unintended bias. What are the world’s flashiest university names on a job application? A global employability league table, published last month, showed the universities whose graduates are most sought after in the international jobs market. Based on the views of 42,000 employers, the most impressive name to stick on a job application was the Massachusetts Institute of Technology in the US. Among UK universities, Cambridge was at number seven, in terms of impressing employers. Is grade inflation really going to be stopped? Education ministers are going to use teaching quality rankings as a lever to discourage universities from pushing up the proportion of top grades. It’s a rather indirect approach – and reflects that universities are independent institutions and they make their own individual decisions on awarding degrees. But there have been complaints about grade inflation for at least 50 years – and always with a different cause. The current rise in grades has been linked to universities in England charging higher fees – and the need to compete with other universities to show they are delivering value for money. But when the US Senate investigated grade inflation, it found that in the 1960s it was being attributed to college lecturers not wanting students to drop out at a time when they would have faced military service.